Maybe you’ve heard of the Mistral wind, that howling, horrific atmospheric anomaly that comes out of the north and down the valley of the Rhone in the wintertime in Provence. Today I saw evidence of its power at the Chateau of Les-Baux-de- Provence, first stop after picking up our guests at the Avignon train station. (Well actually, first stop was our luxurious inn, where we had lunch poolside complete with a couple of bottles of the local rose). 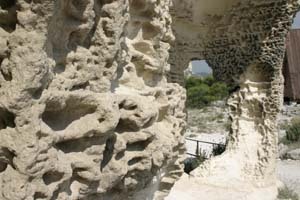 The mistral’s power can be seen in the carved limestone, hollowed out after centuries of wind, sand and rain. The mistral leaves behind a honeycomb design on the rocks all around the chateau. It seems hard to believe that nature can have such a power on a warm, sunny, calm day.